This sample scope of services would be applicable to companies wanting to transition from a mass-production material handling system to a lean system that reliably supplies incoming material to production operations (e.g. assembly lines, small-batch processing, continuous flow cells). Assist client develop a common approach to converting from a mass production material flow strategy to a synchronous material flow strategy. Examples of synchronous material flow strategies include: design in flexibility, drive out waste, rightsize containers for material display, develop operator friendly part presentation devices, minimize forklift activity in productive areas, reduce process variation to reduce buffers, use pull signals to control inventory and replenish stock, maximize use of live unload, JIT scheduled delivery and/or shipping windows at every dock. Establish PFEP database, which includes collecting data on parts, packaging, volume/mix, and routings for every part in the area being analyzed. 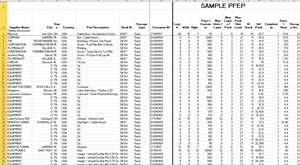 This spreadsheet/database is the foundation for developing realistic material planning strategies, rightsizing inventory levels and optimizing end to end material flow. Determine material display devices and workplace layouts needed to present parts in an operator-friendly fashion (i.e. reduces operator walk and pick time and ergonomic stress) and support standardized work. Define proper inventory at workstations and generate AutoCAD layouts. 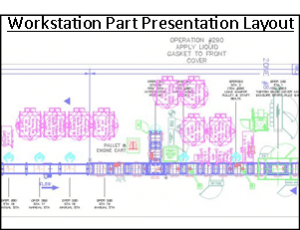 Lean material flow system design typically begins with the production operator then works backward through the pipeline to the supplier with the goal of supporting the operator and eliminating waste. 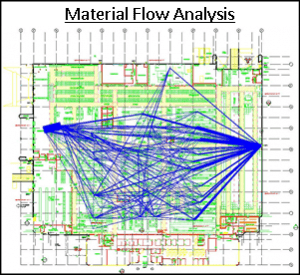 Develop a material flow model, using computer-aided planning tools such as FlowPlanner, from the base layout that includes aisle networks, material routings, packaging data, and replenishment methods. Create material flow diagrams overlaid on AutoCAD layout both point to point (Euclidean) and along the aisles (actual path). Identify optimal receiving dock and storage location for each part based on point of use, container type (e.g. bulk vs. small lot), and inbound ship mode/route. Determine the minimum quantities of delivery equipment/ indirect labor requirements and average utilizations. Develop and test alternative material flow strategies and methods to minimize material handling costs, streamline flow and promote safety (e.g. fork free handling). Identify areas of congestion and provide recommendations for improvement. Analyze parts, containers, volume/mixes, clear heights and information related to inbound material shipments to determine preliminary material storage space requirements within the plant. This provides a quick high-level assessment early in the program of facility and equipment needed for in-plant material storage and will also help identify the potential need for establishing dedicated docks, off-site storage and/or metered deliveries. Develop layout plan for Small Lot Marketplace and Bulk Material CMAs to maintain controlled levels of incoming parts (e.g. 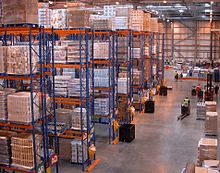 accommodate FIFO and Min/Max inventory management). Include a plan for staging empty returnables. Determine appropriate storage methods and equipment requirements. 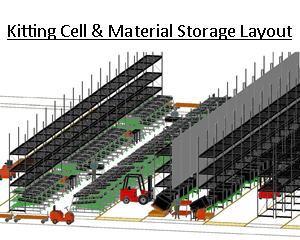 Provide detailed layouts of each storage area showing equipment and footprints for each unit load with part numbers. Create a system that keeps inventory under control by allowing operators to pull just what they need while focusing on producing value for customers. 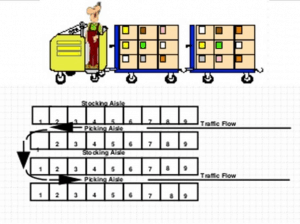 Calculate the appropriate number of Kanban’s needed based on the type of route and delivery frequency. Determine best location and number of dock wells required for each dock area. 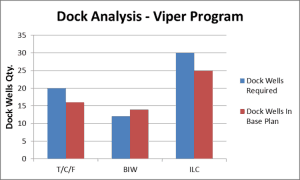 Calculate dock workloads based on carrier loading and unloading times, setup and paperwork, switching time, and delivery frequencies. Prepare AutoCAD layout showing dock marshalling areas, commodity staging areas and empty return areas. 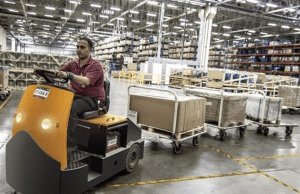 Evaluate alternative material handling and storage methods and layout plans and select those that are most appropriate to support your operating philosophies and business objectives. 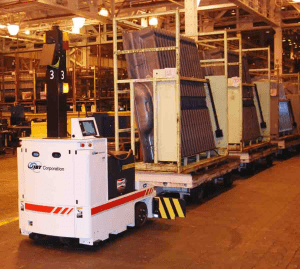 For example, determine the feasibility of replacing Fork Trucks with an integrated AGV system. Develop innovative, cost-effective storage layouts and material handling systems to achieve your customer service objectives. Prepare data-driven plans for repacking, sequencing, kitting, cross-docking, and empty returnable container areas. We’ll design flexibility into your layout to ensure operations can be modified to accommodate changing needs without major expenditures or disruption. 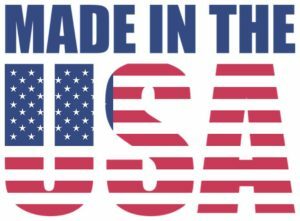 Established in 1991, Productivity Engineering Services LLC is an independent industrial & systems engineering and operations management services firm specializing in the planning, design and implementation of lean manufacturing, warehousing and supply chain operations. PES’ Principal Consultant is Certified in Lean Manufacturing by the prestigious University of Michigan College of Engineering Center for Professional Development. He will combine lessons learned from his formal training with over 25 years of practical real-world manufacturing industry experience to help achieve your lean goals and objectives. To learn more about how PES can help you achieve your lean goals, please call (734) 425-3904 today! !